Support this site by purchasing your Amazon goods through our links below. It doesn’t cost you anything and we get a small commission off your purchase. 8:20pm Kitchen. Lolo, Natalie, Kandi, Tamar and Dina sitting at the kitchen table chatting about random things like Kandi catching ex’s cheating. She cracked his voice mail code and listened to his messages. She said the On-star lady even called him back to leave him her number. Meanwhile outside the HOH room. Tom is playing the piano. 9:10pm Dina and Kandi are playing a game of pool. Dina – she was almost in tears down there. They were kind of ignoring her. It was mean girls! Mean! She should stay in my room if that’s the sh*t that they’re pulling .. I don’t like that! I don’t like mean people. Kandi – I don’t know. I don’t think so. Dina – Natalie. Tom joins them. 9:50pm Kandi, Tamar, Tom and Dina hanging out on the couches outside of the HOH room. Tom heads to the diary room. Dina asks what do you want to do? Its so hard. They’re like best buddies. Dina – she could win. Tamar – that’s what I’m saying. Kandi – if she wins she can put me out on the streets. Dina – what about me? Tamar – no you’re not her target. Dina – but eventually. Tamar – that’s not true. There are five of us.. all five of us have a fair chance. Kandi – she is the best player right now. Dina – she is and him (Tom). Tamar – As long as he is here we have no chance. Its him and somebody else. That’s it! Dina – I don’t know. I need to sleep on it. I need to pray. Tamar – you can’t do personal right now because it determines whether you stay or go. Dina – mine wouldn’t be personal, mine will be strategic. He has to go, if he doesn’t you’ll be out next. Dina – Ricky is good too. Tamar – he is going to win. Kandi – he (Tom) can’t even compete in the HOH. Dina – she asked me what I was going to do and I said Natalie I don’t know. They’re best buddies. Tamar – she (Natalie) said that she was going to fall on the sword. Ricky joins them. Tamar explains how the final 3 part HOH part goes. 10:26pm – 11pm Dina and Kandi. Dina – I can’t believe she just did that. Kandi – trying to get us to keep Natalie. Dina – don’t insult my intelligence. Don’t play me! I’m not a fool. They were trying to convince Lolo to take the fall. We need to get her! They’re ignoring her. They’re being snippy to her. They’re playing that poor kid. They’re playing her. She is a soft hearted person. We need her out of that room now! We need to talk to Tom. And I don’t care if they see us. Ricky is out next. Right?! Kandi – yeah yeah. Dina – and you trusted her. She was playing you like a fiddle. They’re trying to make us believe there is another HOH. 12am HOH room. Dina and Tom. Tom – you’re right they could be telling Lolo that we’re voting her off. She might not know that we actually want Natalie off. Dina – Lolo doesn’t know what I’m doing. Neither does Natalie. They never confide in me why should I tell them. These girls I’m not telling them… I don’t owe them anything. They’ve ever had my back for anything. Tom – you’re right Lolo probably thinks that I’m backdooring her. If Lolo gets really mad at Natalie .. she might just quit. Vote me off. Dina – Natalie will never quit. Kandi joins them. Tom confirms with Kandi that she is going to vote out Natalie. Tom – I just wanted to talk to you and make sure that Tamar and Ricky didn’t try and convince you to vote out Lolo. Kandi – I am a stubborn person I am not changing. If you’re enjoying the live feed updates this season, please consider donating. Any amount is greatly appreciated! Your donations go directly to paying the server and bandwidth fees required to run this site. 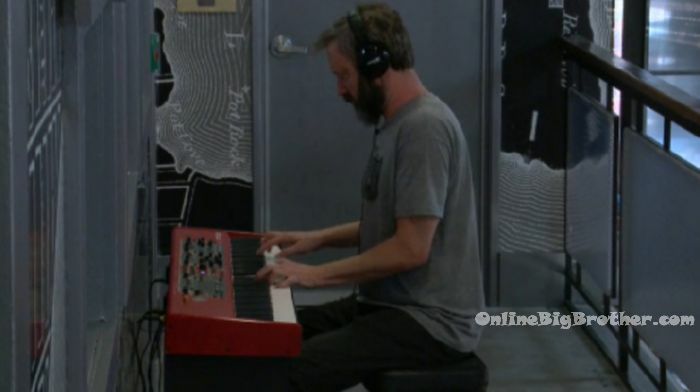 Click here for your CBS All Access – Live Feed 1 Week Free Trial! Tonight should be good. I can’t wait to find out who/what changed Tom’s mind and got him to take Ricki off the block. This is much better than last year that’s for sure. I’m pretty sure he came up with that himself. I seem to remember him talking to the camera in the HOH saying he may do something that no one expects…that would certainly qualify! So happy that duo is coming to an end! Would love for Lolo to follow in the double. Or Ricky. Everyone was sleeping on Dina but she can actually read people ??? ?Natalie is stronger to get out. Lolo is so up and down they can change her mind more than Natalie. I love how the Gold Room keeps saying Kandi hasn’t done anything or Kandi is not playing the game when they only won 1 competition each. They just started saying the same thing about Dina. Just because they are not involved in all the drama doesn’t mean they are not playing the game. Let’s be clear, Tamar doesn’t care about Kandi. The only back Tamar has is HER OWN! And what’s this “let’s let Natalie and Loco decide who goes home” BS??? Was that how it worked for anyone else’s eviction? They are all the biggest bunch of hypocritical, spoiled rotten babies!! If you were to ask me if I would be rooting for Kandi or Dina I the end, I would have laughed in your face!!! But I’ll take them over Loco, Natalie, Ricky or Tamar anyday. I’m still in it for Tom though!!! 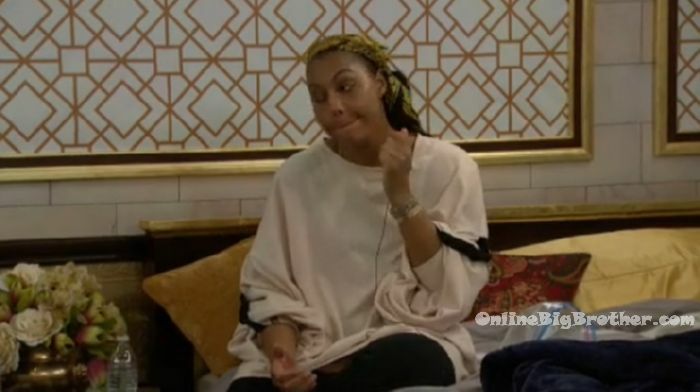 Tamar thinks the biggest move was her HOH evicting Kato? HAHAHAHA! HELLUR??? It’s Toms HOH getting out Natalie (I hope) or Loco and breaking up the strongest alliance in the game! Tom for the WIN!!! Tamar is the type of person that trys to put you down to make herself look better but hopefully not many people fall for that. Kandi was talking about her business and want she wants to do next. Tamar walks in and says what are you talking about, all the money you have? You’re always talking about money. Kandi called her out on it which I was glad about. Tamar was trying to convince Kandi (and Dina) to keep Natalie? As well as hint that there is an extra HOH and to get rid of Tom? I thought she and Kandi had each other’s backs? WTH? That’s hilarious that Ricky and Natalie are going all “mean girl” on Lolo to get her to fall on the sword. I thought they were all BFFL? Maybe they suspect Lolo can be more easily wooed over to Tom’s side after the eviction. Too funny. And what happened to Ricky saying he would fall in his sword for the two girls? Any reason given for why Lolo couldn’t play in the veto? Earlier the houseguests were saying that they’d all play in the veto because of the low numbers. The last Veto that TOM won LOLO wasn’t picked to play. All VEtos moving forward has everyone playing. Last night Tom, Dina and Kandi talking about Lolo and Tom said she can’t afford health insurance but wears Gucci jackets. Dina said Lolo also has 2 rental properties. Now the truth is starting to come out.. Yes Simon! All the more reason to love you! You can’t say that “s” word down here. I agree 100% that all Americans should have health insurance. I guess what I was getting at is part of Lolo’s spiel to the other houseguest is that she needs the money more because she is broke but now they are putting two and two together. I think someone on here mentioned how much she is worth with all of her sponsors. Anyone know why the feeds are down? There’s the double eviction tonight so they’re probably getting ready. Nobody will vote for Tom he has too much blood. nobody will vote for Kandi she isn’t even playing the game and hasn’t won any comps. Tom will win against everyone he’s won so many competitions. Kandi will win against everyone, she has no blood on her hands. So to the gold room they can’t win because… they aren’t gold room. Oh. that clears everything up. Why are Tamar and Ricky shocked that Kandi and Dina aren’t just agreeing to everything they say? What is her motivation? Their motivation is to keep themselves strongest to take out Tom (and Dina and Kandi). What do Dina and Kandi get out of that? If the offer is Help me evict you, who would say sounds like a good plan in response. Oh, right… gold room logic. I know!! 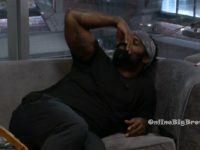 Even Natalie said on the show that by Kandi picking to go against her for the dice competition she shows them no loyalty. Why should Kandi show them loyalty? She was in their alliance for about a day! She was supposed to be in their alliance when Ryan put her on the block. 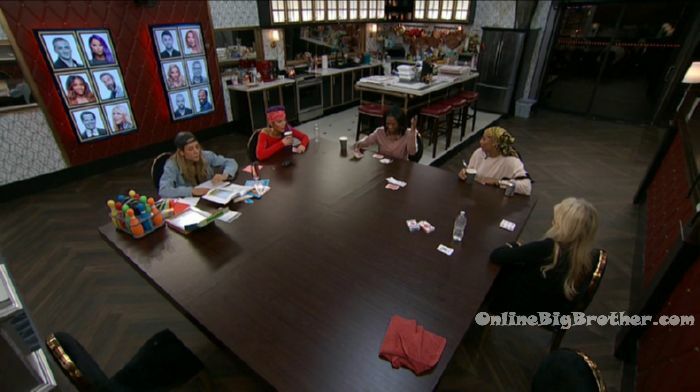 Ryan put Kandi on the block, but because of the Tamar situation, the large alliance had already chosen to exclude Kandi. They chose a side, and Kandi wasn’t on it, but they are still mystified when she doesn’t do what they ask, perpetually. My sources tell me (around 3:30 PM CST) something big happened that we may get a chance to see. I didn’t get anything more than that, so the wait for tonight is a bit painful for this granny. What could it be? LOLO kills Tom LOLO “sleeps” with Ricky? I don’t know, but everything seemed pretty calm last night, so I can’t imagine what it could be. We find out Ariana’s brother never left the BB house and tried to snake back into the competition. On After Dark last night, poor Tom trying to talk strategy to Dina, it reminded me of my 3 year old grandchild who continues to talk as I try to explain something to her. That woman is the same age as I am and has the emotional maturity of a child. She never stopped moving her lips. When the other person speaks, that’s when you stop speaking. Then when they pause, you begin speaking. Bless their hearts, she’s a number and that’s what they’ve got to work with. I completely agree about Dina. She is frighteningly scatterbrained. At first I thought it was an act to make herself seem non-threatening. But…..I’m pretty sure that’s really what she’s like.